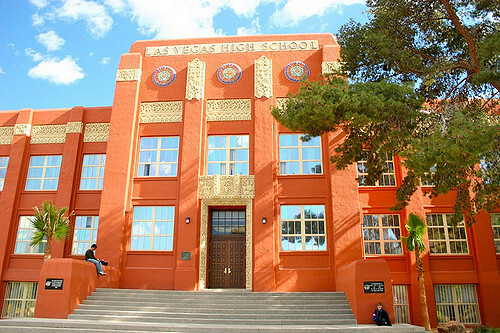 Las Vegas Academy, located at South Seventh Street in Las Vegas, is a premier performing and visual arts school, graduating students since the early 1990s. However, before the art deco building was used as the academy, it was built as the first Las Vegas High School. Back in 1930, workers building the nearby Hoover Dam (then called the Boulder Dam) largely lived in the Boulder City area. However, many found the rules and regulations of the city too restrictive, and families began settling in the Las Vegas area. This influx of residents resulted in the need for a local high school. Construction began that year and by the 1931 the school opened as Las Vegas High School. The main building of the high school was built on land deeded to the city by the Union Pacific Railroad, but in the 1950s, a separate performing arts center was added. It would be this building that would gain a reputation for being haunted, long before Las Vegas High graduated its last student and was taken over by Las Vegas Academy. Students and staff have affectionately named the ghost that haunts the performing arts center (PAC) "Mr. Petrie." Mr. Petrie has been seen in the PAC as an older man wearing a suit and tie. He is blamed for such things as flickering lights, icy cold drafts, misplaced items, and slamming doors that interrupt performances. It is even rumored that there is a picture of Mr. Petrie in the school's 1968 yearbook! But who WAS Mr. Petrie? No one can quite agree on who Mr. Petrie was and how he came to haunt the school's PAC. Some believe he was a former teacher. One lady in particular who had witnessed the apparition while a student strongly believes this to be the case. As she and her friends were talking and laughing loudly, they were approached by the apparition of the older man in a suit and tie who looked at them sternly, and even put his finger to his lips as if to shush them. Others believe Mr. Petrie was an elderly man who died in a house fire on or around the property where the school was built. Believers do like to point out that there WAS a man with a similar name associated with the property. In 1933 a Frank Partie and his wife, Sylvia sold a plot of land to E.A. Clark. This land would later be the land that the PAC was built upon. Frank died in 1964 at the age of 77, but I cannot confirm nor deny that it was due to a house fire---but instinct tells me it wasn't. For years, he was the city electrician for Las Vegas, and you can find several newspaper articles mentioning his work in this capacity, especially during the Christmas season when he supervised the stringing of the city's Christmas lights. He is buried at Palm Desert Memorial in Las Vegas. Whether or not Frank is the "Mr. Petrie" who haunts the Las Vegas Academy is unknown, but to scores of students and staff, SOMEONE OR SOMETHING otherworldly is keeping an eye on the old school! Happy Halloween From Theresa's Haunted History! Happy Friday the 13th from Miss Rose Cade! Monday Meme: Equipment--How Much is Too Much?